Manufacturer of a wide range of products which include apron hinge type perforated slat conveyors. 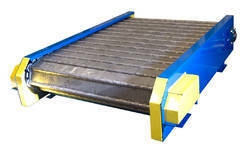 We are one of the leading manufacturers & exporters of Apron Hinge Type Perforated Slat Conveyors. This type of extra high pitch conveyors is usually applicable for conveying for heavy scrap and parts conveying. These are robust and have a low maintenance cost. Always convey a variety of materials for different industries like metalworking, material handling, chip removal and scrap handling etc. Having different applications as Chip Removal, Scrap Handling.